If you can’t make it to the State Historical Museum of Iowa in Des Moines, it will come to you! 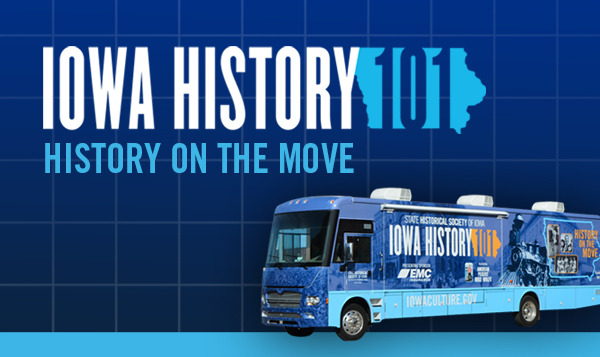 That’s the idea behind the State Historical Society of Iowa’s new “Iowa History 101” mobile museum, a bright blue, custom-built Winnebago that travels the state’s highways and back roads to share stories from the past. The museum on wheels currently houses a 300-square-foot exhibition called “Iowa History 101” and is filled with artifacts from the State Historical Society’s collection. The mobile museum will visit Winterset on Sunday April 9th and offer free tours from 1:00 – 5:00 pm at the Madison County Historical Complex at 815 South 2nd Ave.
“This exhibition shares some of the essential stories that every Iowan should know about who we are and what we’ve achieved since Iowa became a state more than 170 years ago,” State Historical Society of Iowa Administrator Susan Kloewer said. “So we’re delighted to bring this traveling exhibition to Madison County, and we encourage all Iowans to learn about our state’s rich heritage.” The traveling exhibition is sponsored by EMC Insurance Companies, Casey’s General Stores, and Iowa State University Extension and Outreach. It is part of a trio of new exhibitions called Iowa 101 that digs into the bedrock stories that every Iowan should know. More information is available by contacting Jared McDonald at 515-462-2134. 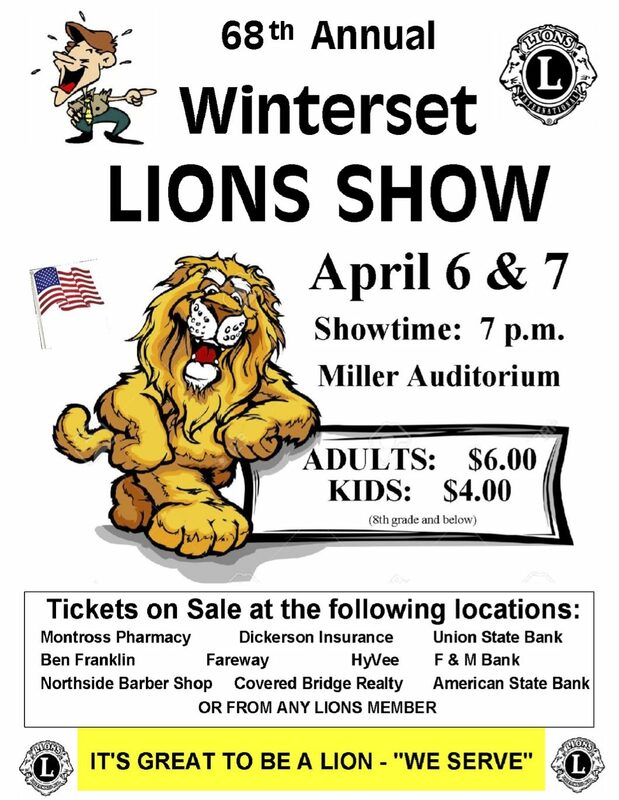 Along those lines, if you’re from Winterset, here’s an event you should know: The annual Winterset Lion’s Show will be held on Thursday and Friday, April 6th & 7th, in Miller Auditorium at 7:00 pm. Friday night’s show will include our National Champion WHS Dance Team! The Winterset Stage will offer its final two performances of The Shadow tonight (sold out) and Saturday night at 6:30 pm at their 405 E. Madison location. 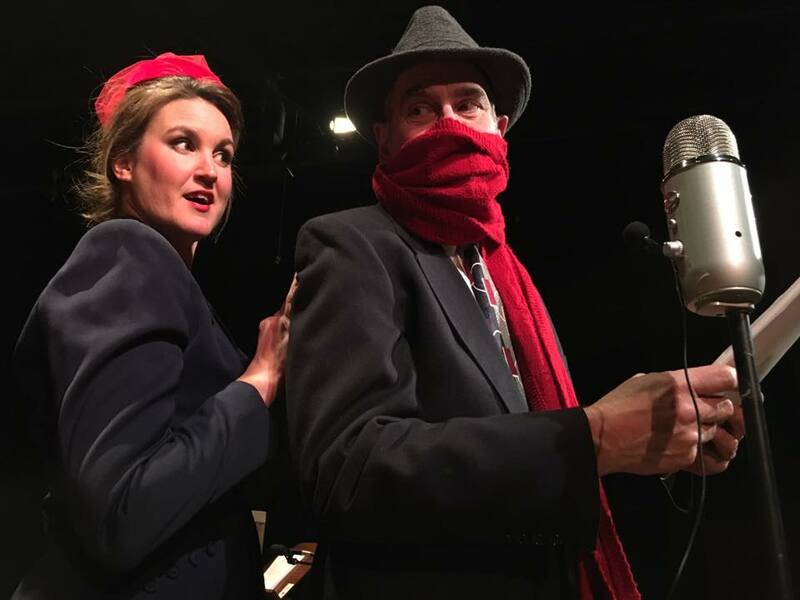 Based on the 1930s and 40s radio show The Shadow, made popular by Orson Welles, the zany characters in this all-local cast received rave reviews from last weekend’s attendees. Each show is designed as a murder mystery dinner theater featuring a 40s-era menu: spinach salad with strawberries and candied pecans, salisbury steak, roasted potatoes, Catalina vegetables, dinner rolls, and chiffon cake for dessert. Additional show dates are Saturday, March 25th; Friday, March 31st; and Saturday, April 1st. All shows start at 6:30. Tickets include dinner and the show, and can be purchased online at www.TheWintersetStage.org or by calling 515-462-5156. Get your tickets for The Shadow before they’re gone! All are welcome at the St. Joseph Catholic Church’s parish hall for Fish-Fry Dinners on Fridays through the end of Lent, 5:30 to 7:00 pm. The price is $9 for adults and $5 for kids (maximum $25 per family). The menu includes fried fish, baked fish, baked potatoes, french fries, cole slaw, green beans, corn, cheese pizza, macaroni and cheese, dinner rolls, beverages and dessert. Dinner is hosted by the Knights of Columbus. 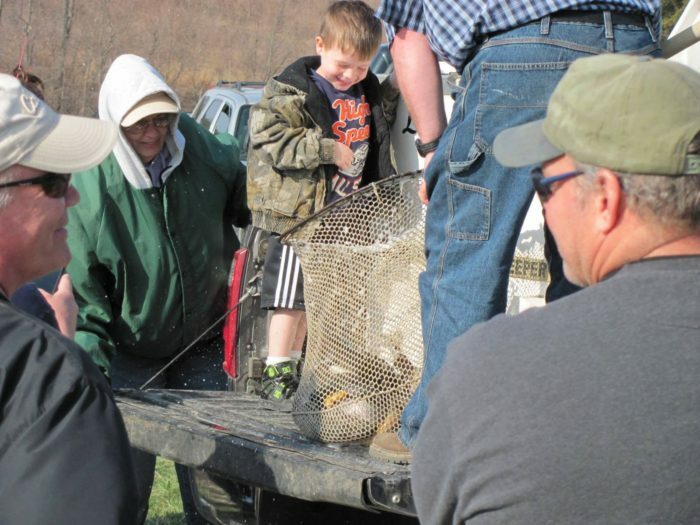 The Madison County Conservation Board will host a trout stocking program at Criss Cove at 9:00 am on Saturday morning, April 1st. It will be a short program on trout biology and fishing license requirements followed by a fun-filled morning of trout fishing. All adults wishing to fish for trout need to have a valid fishing license and a trout stamp. Daily bag limit is 5 trout. Children under age 16 do not need a fishing license as long as they are fishing with a licensed adult. Children must share the daily bag limit of 5 fish with their accompanying adult. Fishing licenses and trout stamps are available for purchase in the Recorder’s office at the Madison County Courthouse and Breedings Hardware. 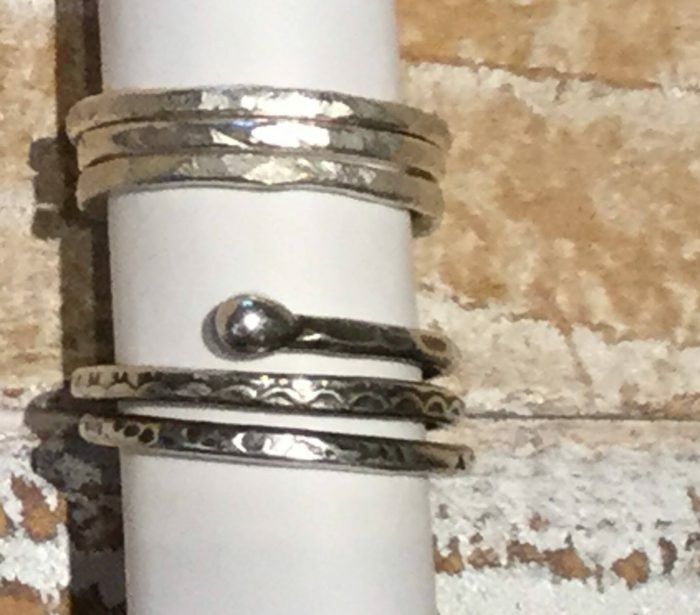 1st Avenue Collective is hosting a Hammered Ring Class on Saturday, April 1st from 1:00 to 3:00 pm. Learn to texture, hammer and fuse fine silver wire to create an assortment of rings. Students will receive enough wire to create 1 wraparound ring and 2-4 stackable rings depending on your ring size. This class is a great introduction to torch work. No prior jewelry experience needed, just a desire to create. Use of tools and materials are included in the class fee of $60.00. The instructors are Gina Crow and Sandra Geronimo. Pre-registration is required. Call (515)505-4396 or stop by 1st Avenue Collective to reserve your space. 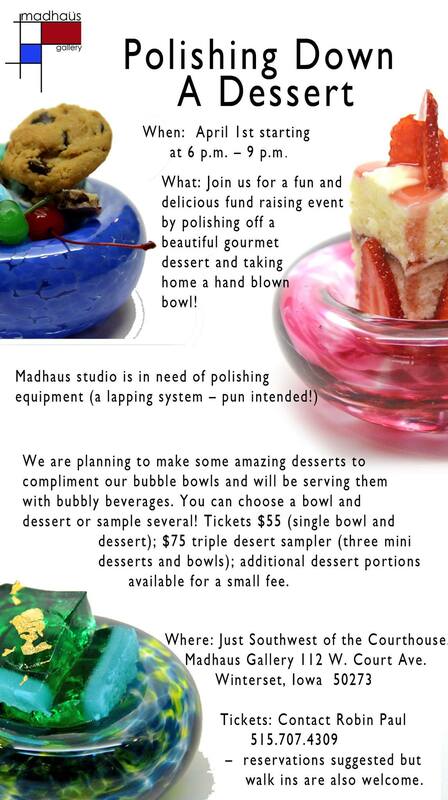 A really fun event is planned at Madhaus Gallery this Saturday evening. Call Robin Paul at the number below to see if there is still space available. Covered Bridges Winery will host Gina Gedler and Ben Hagen for a Music at the Winery event on Saturday evening from 7:00 to 10:00 pm. Gina is currently the lead vocalist with the Ballyhoo Foxtrot Combo and the Soya Vista Jazz Orchestra, as well as a guest lead vocal for several other local bands. Ben Hagen will accompany her on keyboard. There’s a $5 cover at the door, and Rodell’s Smokehouse will have food available from 6:30 to 8:30 pm. 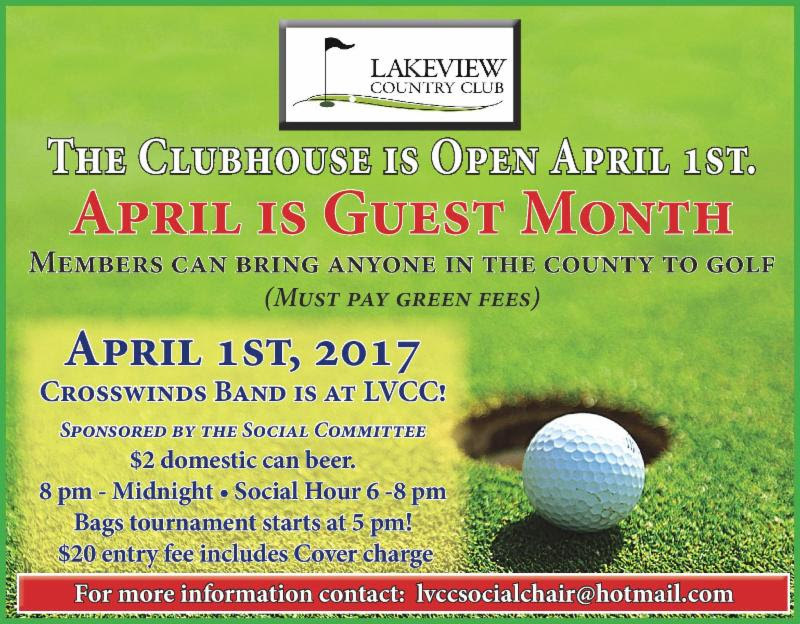 Saturday also marks the seasonal opening of the Lakeview County Club! 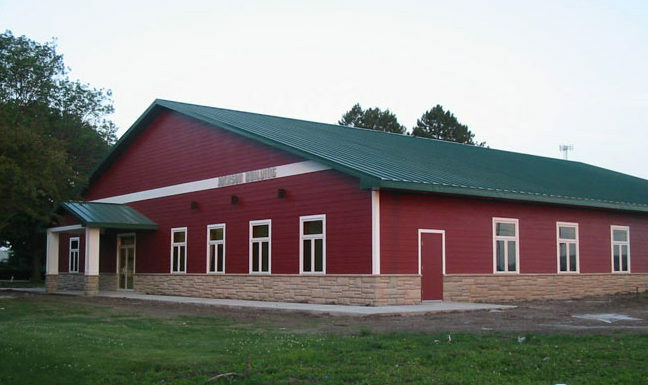 The Covered Bridge Antiques Show will be held at the Jackson Building on the Madison County Fairgrounds on April 8, 9:00 to 5:00, and April 9, 10:00 to 4:00. Shop from over 20 vendors and dealers across the Midwest, including Iowa, Colorado, Kansas, Missouri, and Illinois. Featured items include jewelry, glassware, coins, primitives, toys, silver, and more. Lunch will be available by “Two Ol’ Grannies” on site, featuring giant cinnamon rolls, soups and sandwiches. $3.00 admission at the door is good for both days. For more information, contact Larry Gilbert at 618-210-8158, or Steve Schmalzried at 515-314-9224. Don’t miss the Covered Bridge Antiques Show at the Jackson Building on April 8 & 9! 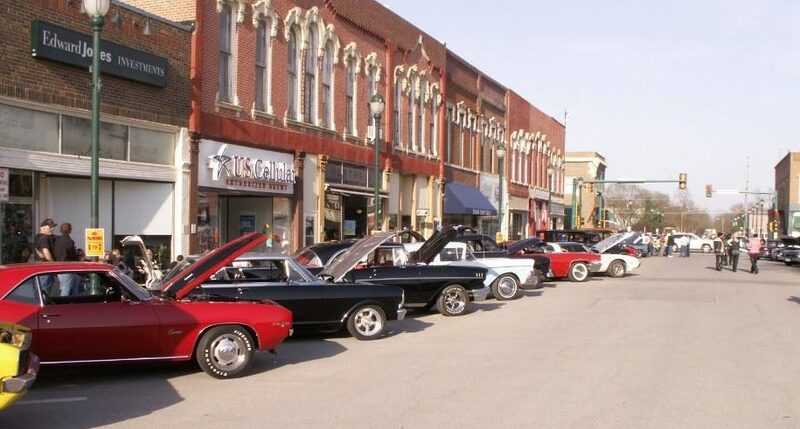 Hopefully the weather will warm up for the first Classic Car Show & Shine of the year, hosted by the Central Iowa Auto club on Saturday, April 8th from 4:00 to 7:00 pm on the Winterset square — featuring classic cars and trucks, oldies music, and lots of fresh air. 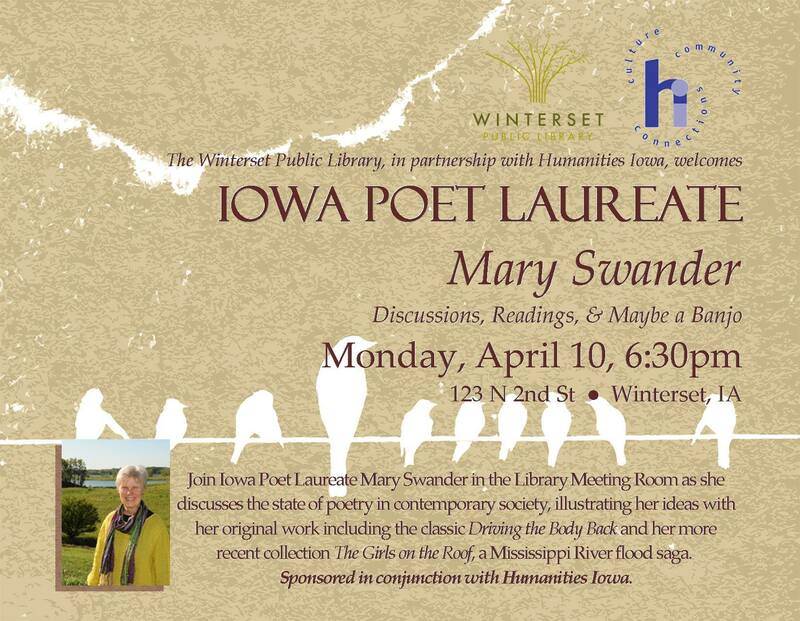 The Winterset Public Library will host Iowa Poet Laureate Mary Swander on April 10th at 6:30 pm. 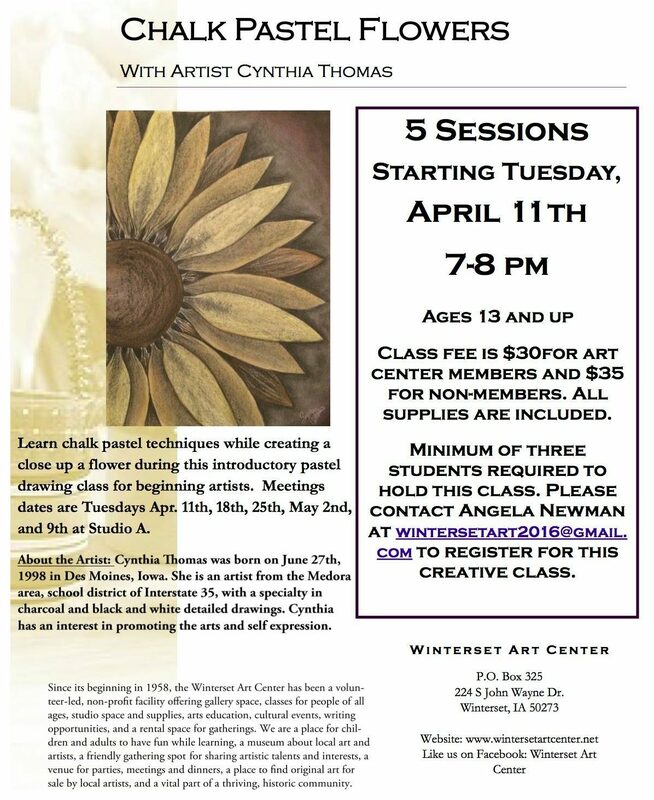 A new five-week class is beginning at the Winterset Art Center on April 11th: Chalk Pastel Flowers with Cynthia Thomas. Finally, a word on the fundraising progress of the much-anticipated Iowa Theater. They are making great strides toward their goal and plan to be open at the end of May, in time for the John Wayne Birthday Celebration. Thank you to American State Bank for their $10,000 donation to this great project! 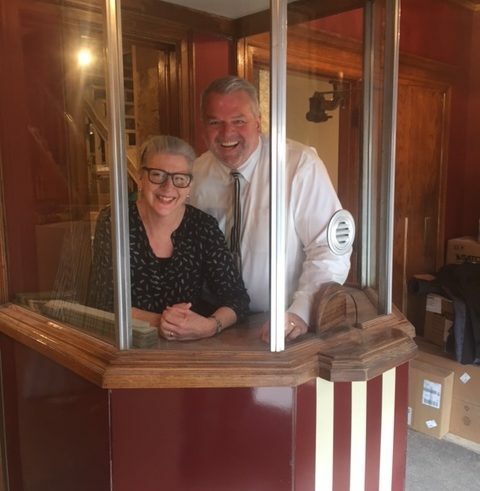 Marianne Fons and Dan Nielsen, Market President of American State Bank in Winterset, pause for a photo in the lobby of the soon-to-be-open Iowa Theater.